Whether made from wood, concrete, interlocking blocks or other materials, retaining walls can spruce up a yard, control erosion and create usable spaces. For a wall to be successful, however, it needs to be planned and built correctly, with proper attention to good drainage and construction. If soil behind a wall becomes saturated, and that wet soil freezes and thaws multiple times, it can “heave” upward and crack the wall. Mild-winter areas can have similar problems caused by too much water. Either way, good drainage can help guard against problems. Gravel backfill behind the wall, regularly spaced weep holes in the wall itself and 4-inch perforated pipe just inside of the wall are methods used to provide drainage. The gravel allows water to drain freely until it reaches the pipe or weep holes. Proper drainage may require a combination of these methods, and a professional can make that determination based on the slope, climate and soil type. Retaining walls hold back an immense load of soil. For example, a 4-foot high wall must hold up to 20 tons of wet soil per 15-foot length. A strong wall starts with an appropriate base set below ground level (the height of the wall determines how deep the base needs to be). The base is made of compacted soil, compacted sand and gravel. Once built, the wall needs to be backfilled with at least a foot of gravel or crushed stone. The remaining backfill can be comprised of native soil if the area behind the wall will be landscaped. In addition, landscape fabric should be used between the gravel and the native soil to prevent sediment from filtering down and clogging the gravel and perforated pipe. 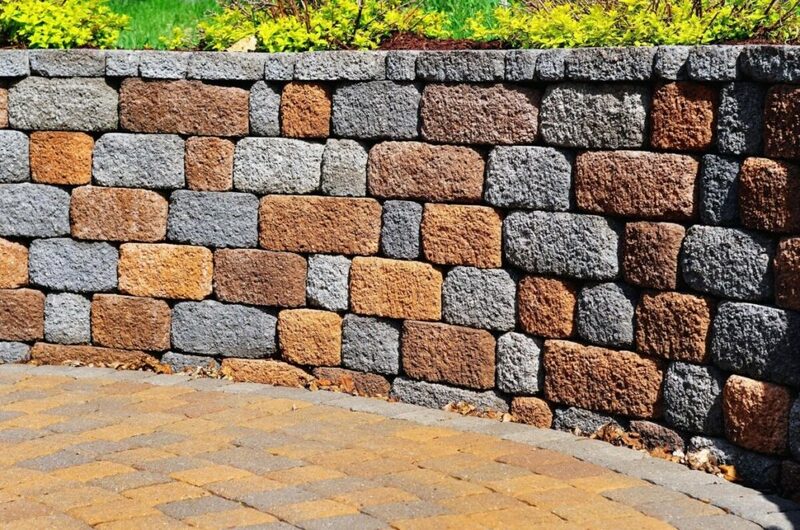 Retaining walls not only enhance the appearance and usability of a yard, they also control erosion and protect nearby structures. Proper drainage and sound construction can help these walls last for decades.